Click on the following links for monthly newsletters with events and other club information. When you click on the month, a PDF of the Welcome Mat will appear. You can then print out the entire issue or just the pages that interest you, or you can save it to your computer for future reference. Log in to the AustinNewcomers.com website and click on News and Events in the bar at the top. You can scroll down the list of events by date to find the one you want. Click on the one you want to register for. 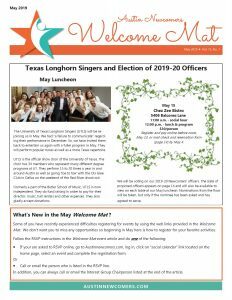 Log in to the AustinNewcomers.com website and click on News and Events in the bar at the top and scroll down to calendar to see the entire month of events. Click on the one you want to register for. You can also click Calendar on the left side of the News and Events page to access the monthly calendar. In addition, you can always contact the interest group chairperson by phone or email, whichever is included in the Welcome Mat. Have an interest group event to submit to the Welcome Mat? Fill out our form. *PHOTOS ON THIS SITE MAY NOT BE REDISPLAYED ON ANOTHER WEBSITE OR REPRODUCED FOR ANY USE WITHOUT PERMISSION OF THE PHOTOGRAPHER AND AUSTIN NEWCOMERS.